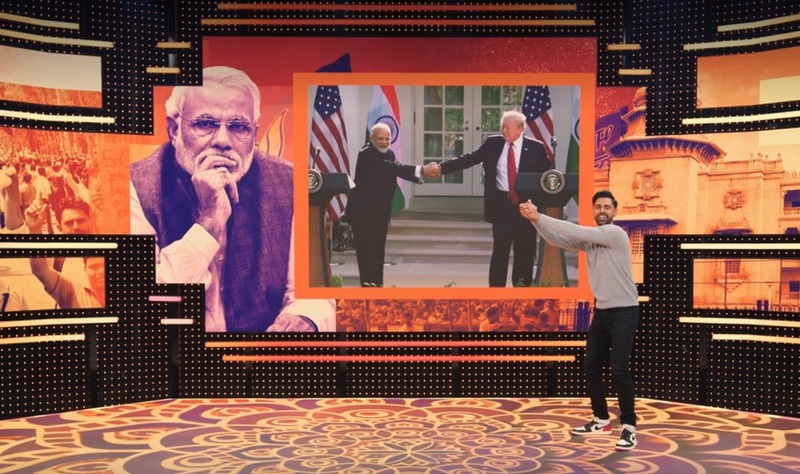 The latest episode of Patriot Act with Hasan Minhaj discusses stakes in Indian election. After scrutinizing Amazon, Saudi Arabia, oil, affirmative action, student loans and hip hop, Indian American comedian Hasan Minhaj turns attention to politics in “Mother India.” The latest episode of the former Daily Show correspondent’s popular Netflix show Patriot Act dissects the upcoming general elections in India with all seriousness — and levity. The show begins with Minhaj’s conversations with a number of Indian American “uncles” and “aunties,” who advise him against doing a show about Indian politics. Minhaj explains the stakes in the election: “Since [Prime Minister Narendra] Modi came to power, India has grown more hostile to minority groups. Among a vocal minority, there has been a resurgence in religious nationalism, specifically Hindu nationalism, the idea that India is a Hindu nation,” which is against secularism, enshrined in the Indian constitution. Joking about his background as a Muslim, the comedian says he might be branded as a Pakistani agent, or a Qatari agent, or an Iranian, or a Saudi. One of the highlights of the episode is Minhaj’s interview with Congress Party leader Shashi Tharoor. The comedian asks the former minister to name one political figure in the United States that Americans could identify Tharoor with. But the Member of Indian Parliament says that there is no equivalent, as the systems in the two countries are different. Minhaj says he also wanted to get BJP’s version, but its officials did not respond to interview request. The show also speaks about, among other issues, corruption and criminality in Indian politics, the absurdities and the banalities on Indian television, and the much-talked about hug between Modi and President Donald Trump during their White House meeting a couple of years ago. Minhaj, who came to national prominence through Comedy Central’s The Daily Show, as a “senior correspondent,” launched the Patriot Act in October 2018. He is the first South Asian American to have a weekly show on Netflix. The show’s co-creator is Prashanth Venkataramanujam, an Indian American Emmy nominated writer. Mr Hasan should stick to comedy and not politicise his show. He is totally biased in his views AND gives one the feeling he is a sympathiser of terrorist activities sponsoered by Pakistan. Tell him to do a program on ethnic cleansing of minorities in Pakistan if he cares so much about democracy and freedom. He portrayed very badly, his opinions are biased. you are right — he did a terrible job. he paints india as a third world “s*hole” where you have 2 choices, a racists fascist regime or a corrupt murderers. not once does he mention that this nation has outpaced China as the fastest growing economy on the planet. It’s not a right vs left thing as americans understand it. It’s a fact that the right here, cut taxes, especially on the rich. while the BJP increased taxes, especially on the rich and that was purpose of demonetization (though yes it had issues). India opened up LGBT rights, women’s rights recently, while the GOP is opposing the ones we have now here. Bernie on the left, ran on similar populism and nationalism, though again, India is improving global trade. India gave everyone some healthcare coverage, where as GOP is against it – and is proposing medicare and medicaid cuts. like it just doesn’t compare. it’s the worse summary I have ever seen, very wrong, very inaccurate, and frankly – he should delete it. India is a great nation with great protections for all citizens except that we are heavily impacted by radical muslim terrorist attacks like one in Mumbai and routinely around the country. Pakistan neighbour is fighting a proxy war.